Bright, family friendly spot serving feel-good food and premium drinks all day, every day. It’s the perfect place to bring your kids and dogs are most welcome too. We have special dog menu containing snuffle dog beer and various other treats. We are only minutes from Harrison Park and the Union canal which is popular amongst dog walkers. 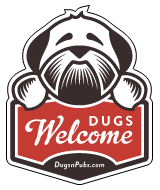 There are a total of 8 dog friendly listings in the Gorgie category. Please log in, or sign up as a member to view all listings.